NOTE: More Grand Marais scenes are posted often on my blog at www.agatelady.blogspot.com and on my main personal Facebook page at https://www.facebook.com/karen.brzys . 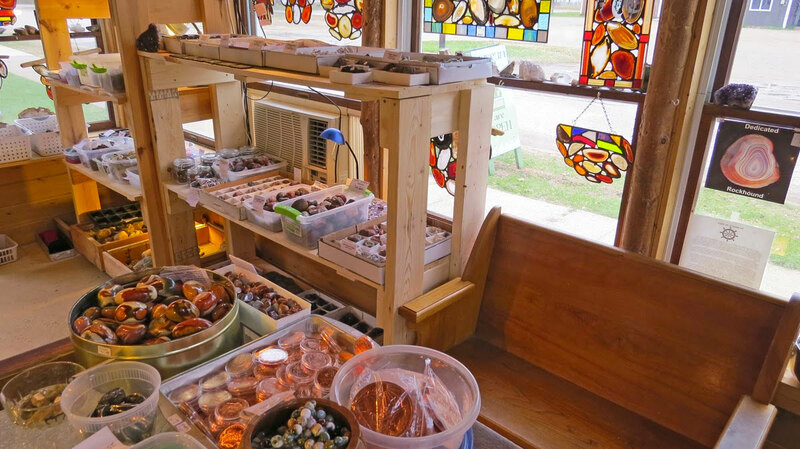 I also post agate photos, shared mostly on various Facebook rockhounding sites, to the museum’s Facebook page at https://www.facebook.com/pages/Gitche-Gumee-Agate-and-History-Museum. For this webpage update, I have selected some of my favorite pictures that I took in the Grand Marais area between July and early November of this year. Those of you who have followed my webpage and my blog know that I love being in the right place to take photos of animals in nature. During a hike in the western part of Grand Sable Dunes, a friend of mine spotted the snowy owl shown below. I also take many pictures of Lake Superior sunsets. One that I took late summer is below. In early September I went on a hike with friends in the Pictured Rocks National Lakeshore. We hiked the Chapel Loop, which is around 9.4 miles long. Two photos are below. This past two years we have seen a considerable amount of erosion on the local beaches. It is difficult now to walk west of Grand Marais to the Sable River. Also, my favorite agate hunting beach east of town is no longer accessible. A photo of the bluff is shown below. The fierce storms and the waves that result are responsible for the erosion. A series of three photos I took of the lighthouse at the end of the breakwall document some of these waves. This has been the warmest and most beautiful fall since I moved to Grand Marais in 1994. Below are a few of the fall photos. Below is another fall photo of Sable Falls. Of course, I have to include a couple fall photos of Sable Lake and one of the Grand Sable Dunes.